When I first heard about Fire, Flour and Fork, I thought it sounded like a great way to celebrate Richmond’s diverse food scene from a food history perspective. Planned by Real Richmond Food Tours, the weekend-long event spans tastings, dinners and educational sessions. Now that the schedule of events has been released, I can’t wait to get my tickets! 10 AM – At the Counters | Nicole A. Taylor, Dr. Raymond Hylton and Elizabeth Thalhimer Smartt | 10 a.m.
History books tell the story of segregation. Better still, “If We So Choose” is a documentary short film, produced by Athens, Georgia native Nicole Taylor, which introduces audiences to the people in Athens who not only lived through Jim Crow separatism but fought against it and won. Through the lens of a little-known protest demonstration at the lingo laden fast-food restaurant, The Varsity, new light is shed on unsung, young African American heroes. Turning the lens on Richmond, Dr. Raymond Hylton, chair of the department of History at Virginia Union University and author Elizabeth Thalhimer Smartt will share the story of the Richmond 34 and their sit-in at the Thalhimer’s lunch counter on Feb. 22, 1960. We’ll see the new trailer of The Richmond 34 by Bundy Films as well. In light of the events in Ferguson, MO, it’s more important than ever for Americans to come together to discuss our shared history and the importance of the civil disobedience of the 1960’s to the Civil Rights movement. When I visited Memphis last summer to study the history of barbecue, I learned much about how race has played into food history. My mother, a lifelong Richmonder, has told me of the Thalhimer’s sit-in and other actions in the 60’s, and I’d love to check out the film and get a new perspective on Richmond’s role in the larger movement. Known as “Queen Molly” the woman who set the finest table in early 19th-century Richmond, Mary Randolph and the unnamed enslaved cooks in her kitchens produced food that set the standard for excellence in Southern cookery. Historian Leni Sorensen is cooking her way through the recipes in Randolph’s book, The Virginia House-Wife, first published in 1824. The book is considered to be the nation’s first truly regional American cookbook and the most influential of its time. “If I’m talking about food, I’m also talking about history,” Sorensen says. I’ll admit, I’ve kinda got a thing for Mary Randolph. I was born and raised in Virginia and have traced my Virginia ancestors back to the 1600’s, so I’m partial to learning about colonial cooking methods and recipes. In my study of “The Virginia House-Wife,” I’ve come across Leni Sorensen’s work, and I’m excited to learn more about Mary and the enslaved women of her kitchen. I’ve tried a few of her recipes (including her Tavern Biscuits, which are pretty much my favorite cookie ever), and want to try more! Come on, what Richmond foodie worth their salt (see what I did there?) wouldn’t want to attend a session with Comfort’s chef de cuisine? Besides, Virginia has a long history of apple growing and processing, dating back to Jefferson’s Monticello, if not further. That Apple Stack Cake sounds delicious! It’s not just the baking-themed tattoo that draws me to this session. My first “real” job was at a local gourmet bakery, and baking is one of my passions. I always love to pick up new tips and tricks, but have had trouble with breads and yeast-based baked goods (cookies, cakes and brownies are my specialty). I’ve got a crowd to bake for at Thanksgiving, so hopefully I can pick up some good recipes and techniques. The event runs from Thursday, Oct. 30 with a reception at the “rarely-open” Eclectic Electric Appliance Museum to benefit Lewis Ginter Community Kitchen Garden, and concludes Sunday, Nov. 2 with “Queen” Molly Randolph’s Monumental Moveable Feast and tours of Monumental Church, and a tour of food-related art at the Virginia Museum of Fine Arts. In spite of threatening weather reports all week, yesterday’s Edible Food Fest in Orange couldn’t have had a more gorgeous day for the food-packed festival. The Edible Food Fest, sponsored by regional food magazine Edible Blue Ridge, the local Blue Mountain Brewery and the Orange Downtown Alliance, showcased the central Virginia region’s finest foods, from farmers and food producers to local and regional restaurants. 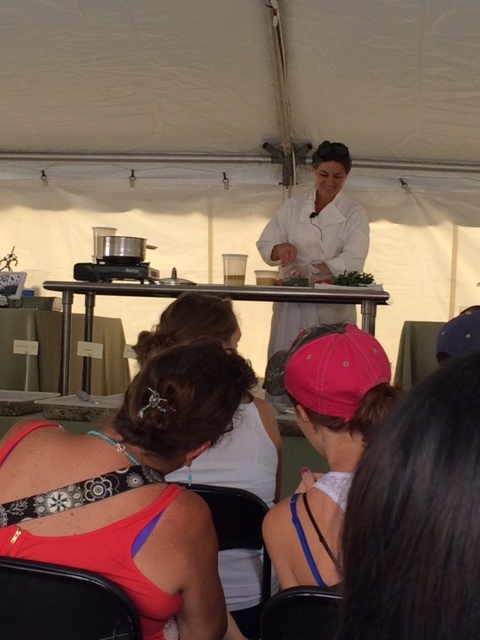 Two Chef Demo tents and a “Chat Room” offered cooking demonstrations and discussions throughout the day. 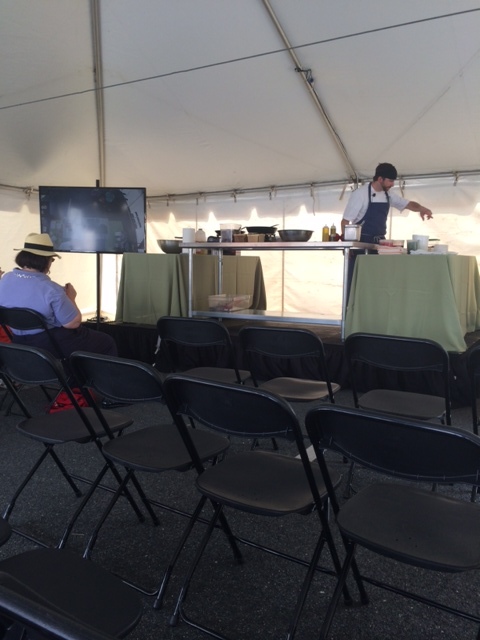 I got to take in a demonstration of okra recipes by chef Curtis Shaver, of Charlottesville restaurant Hamilton’s at First and Main, as well as a discussion and tasting of “Ancient and Modern Grains” by Currey Fountain, of local catering company Beggar’s Banquet Catering. 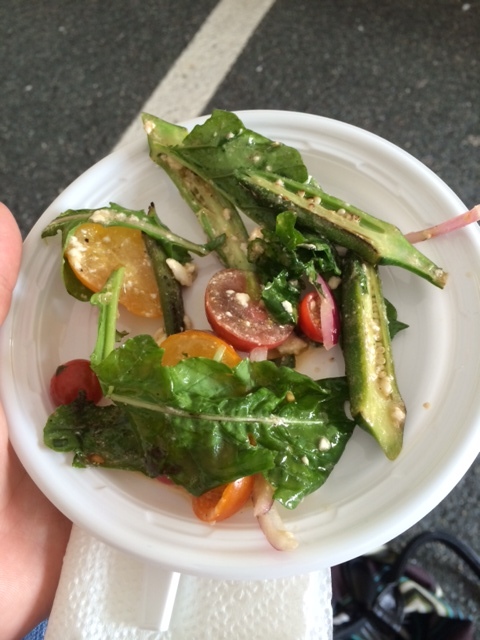 Chef Shaver covered two delicious okra recipes, a charred okra salad with arugula, feta, heirloom tomatoes and a mustard-based vinaigrette, and an okra “maque choux,” a traditional Creole side dish to which he added beautiful purple Red Burgundy okra. (A caveat for the picture of his demonstration – it was taken before the demonstration began. By the time he’d cooked up these two yummy okra dishes, the house was packed!). The main point to remember with okra, he explained, is that it needs to be cooked quick and hot, or long and slow. Quick and hot, like pan charring or grilling, especially after marinating, will help keep the slime factor down. Long and slow cooking will let the slime from the okra mingle with other flavors and thicken stews or other thick types of dishes. I can’t wait to try out these recipes with all the okra I keep getting from my garden. 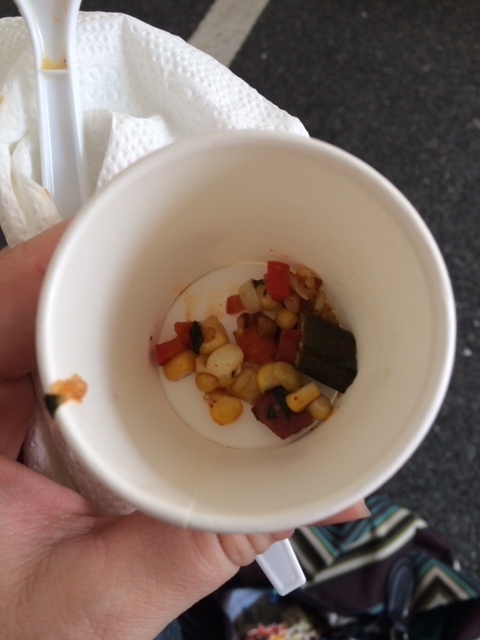 Currey Fountain’s discussion and tasting focused on the use of ancient and modern grains in menu planning. She started with a look at her food restriction list, which, 15 to 20 years ago, used to cover about four or five broad categories. Today, it’s four pages long and covers everything from gluten intolerance and/or sensitivity to Halal, Kosher and other religious restrictions, dairy intolerant, peanut allergies, etc. Since so many of the clients of her catering company were mentioning dietary restrictions, Currey decided to make menu choices that would be healthy, delicious and also accommodate the numerous dietary choices and restrictions that are prevalent today. She had brought pre-prepared dishes using grains such as millet and quinoa, and she prepared a yummy couscous dish during the session. 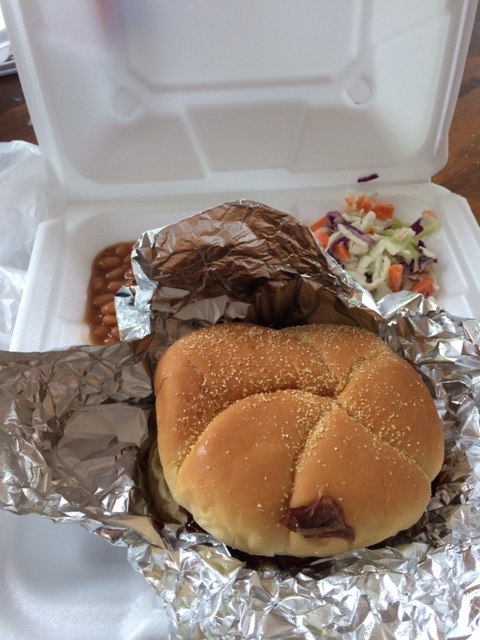 For lunch, I had a brisket sandwich from The Little Country Store, with sides of baked beans and coleslaw – so good! I also got to do a tasting of ciders from Albemarle Ciderworks. I’d tried hard cider before, but never had a tasting of multiple varieties, and I hadn’t realized how different the flavor profiles of different varieties could be. 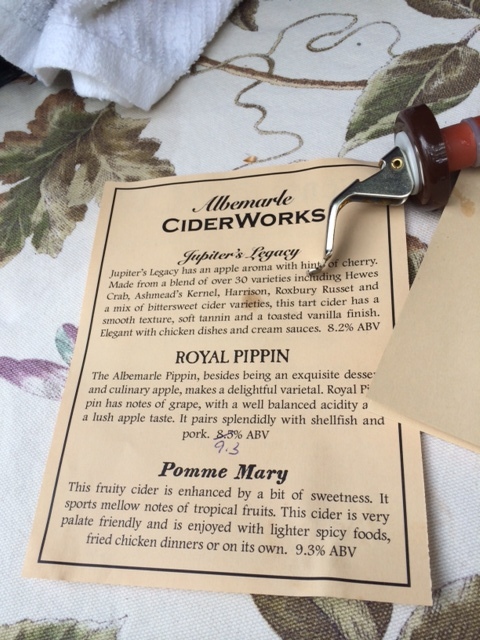 I also enjoyed the historical details about the ciders, like the fact that the Royal Pippin cider uses Albemarle Pippins, a descendent of Newtown Pippins from the North that Thomas Jefferson grew at Monticello, and which the ambassador to England in the early 1800’s introduced to the Queen. From there, they came to be known as Royal Pippins, as the Queen would order hundreds of pounds of them at a time to be shipped to England as her favorite apple to eat fresh. All told, we had a great day at the Edible Food Fest. The event really touted locally-grown ingredients and local food producers, and yet it was accessible to all kinds of people (admission was only $7 a person and kids were free). It really made me wish the Richmond area would put on an event like this to showcase Richmond area growers, food producers, restaurants, food trucks, etc. I enjoy Richmond’s wide range of food events, but it sometimes seems like they are limited to only people who can afford to spend $40 or $50 on a beer or wine dinner, or $60 for a food tour. 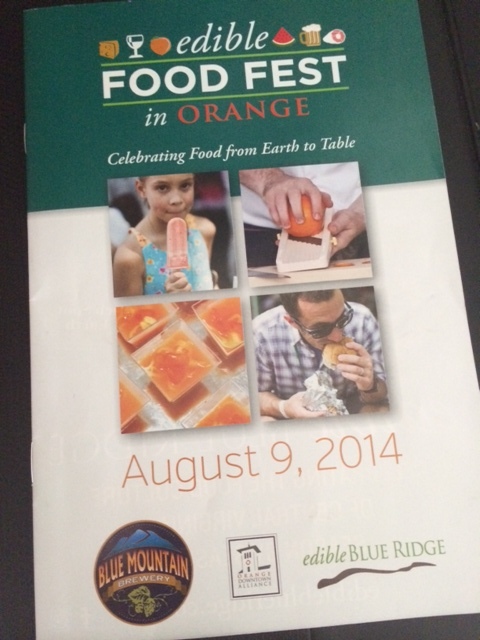 I also realized that the Richmond region doesn’t have an Edible publication like Edible Blue Ridge. There are Edible magazines throughout the country, and the magazine and its various imprints have won many awards for their coverage of local food scenes. I’d love to work with anyone who is interested to try to bring about an Edible Richmond Region magazine. I had heard many months ago that Richmond was getting a Southern Season store, and I was so excited to head over to check it out this past Friday. The store opened July 31 on Staples Mill Rd. near Willow Lawn, and there are festivities galore going on for the first few weeks. Of course, there are giveaway boxes throughout the store to win gift baskets, prepared meals, a Le Creuset cookware set and more. 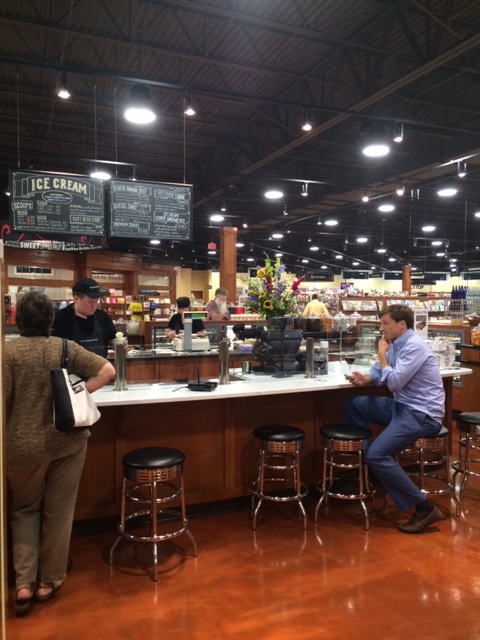 On Saturdays, the store also does tastings of various Southern and local products. The store has a huge gourmet kitchen, where it will offer numerous cooking classes such as Perfect Pies, Biscuits 101, Perfect Pasta, a Kids in the Kitchen series for children and classes featuring local chefs, such as Virginia Is For Food Lovers: Rappahannock. Classes run from $30-50, however the store also offers the option to become a volunteer (from my understanding, essentially a prep chef and “go-fer” for class participants) and attend the class in that capacity for free. Other special events, like beer and wine events and farm-to-table dinners, are scheduled throughout the Summer and Fall. There will also be a special class given by Cut My Plastic, they will teach us easy at home decor tricks for the kitchen. The store itself is big, open and airy, and is separated into several distinct areas. The wine and coffee bar at the front of the store offers the chance to buy a glass of wine or cup of coffee to sip as you’re shopping. Southerly Restaurant & Patio serves breakfast, weekend brunch, lunch and dinner and has desserts and kids’ options. They also prepare a $5 pancake breakfast every Saturday, and kids 7 and under eat free. A section with cookware, tabletop and cooking accessories and implements runs the gamut from Le Creuset and gourmet cookware to artisan cutting boards to nifty little kitchen gadgets, like a sushi-making kit. Candles and home decor, including Southern-inspired items, like pillows sewn with place names and sayings from different Southern states, offer a great shopping destination for gift-giving. A full candy section, with Jelly Belly dispensers lining the back wall and a full-service ice cream bar in the middle, made my three year-old squeal with delight (then cling to my leg in tears as we tried to leave). 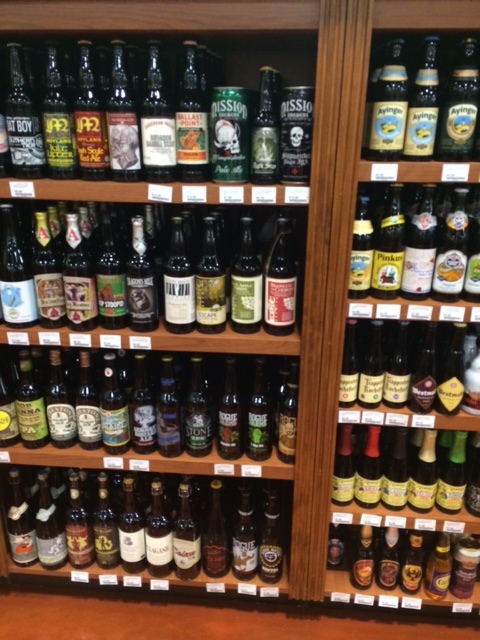 The wine department offers selections from around the world, as well as around the South. They did have a number of Virginia wines, but I’d definitely encourage them to widen their selection. Same with the craft beers. They had good representation from local vendors, but there could easily be a lot more there. Virginians love their homegrown wine and local craft breweries! I did notice some Viking mead from Denmark that caught my eye – I can see a purchase of that in my future when “Vikings” on the History Channel comes back for Season 3 next Spring. 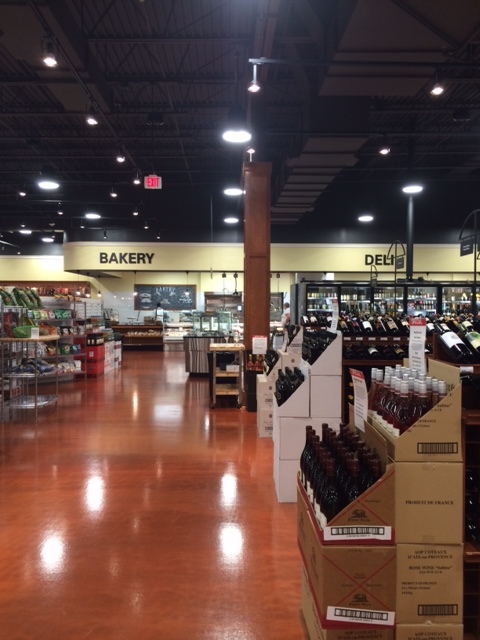 The wine department is right next to the cheese department, which makes good sense for party planners. Cheeses from all over the world, as well as a full-service deli and prepared foods, make this a one-stop-shop if you’re planning an event. A bakery stocked with Southern favorites like Hummingbird Cake and Apple Galettes rounds out the fresh food options. The bulk of the store’s products line the wire racks and shelves in the center of the store. A section of Virginia and local products showcases many vendors who will be familiar to those who receive the Virginia’s Finest catalog. Herb and spice packets containing spice mixtures and blends, file/sassafras powder for gumbo and other Southern pantry essentials are reasonably-priced and high-quality. After a good walk around the store, I can definitely see myself heading out here to pick up specific items I might need for recipes. Southern Season is also a great gourmet shop, and I’d love to try my hand at volunteering for some of the cooking classes. 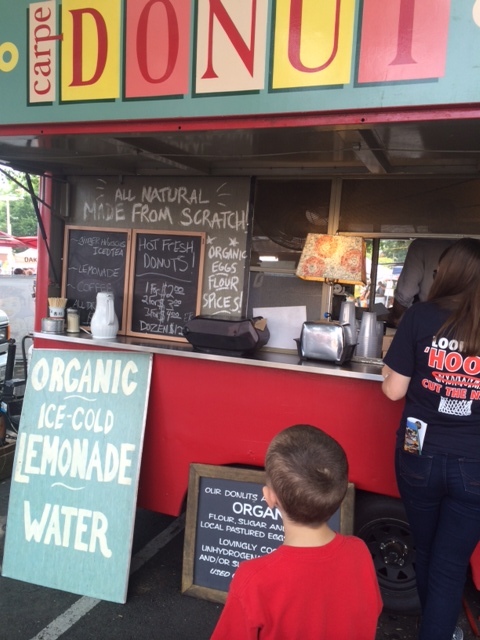 Stay tuned for more coverage of happenings at Southern Season!